Lithuanian delegate to the European Commission, Social Democrat Vytenis Povilas Andriukaitis says that the Social Democrat party is in a deep crisis after the elections. He is critical of the choice of ministries by the party and says that the Social Democrats should focus on the ministries of social security, education and healthcare. “These elections have displayed that we are in a deep crisis. The crisis of Social Democracy is clear and I urge to consider the lessons, why our voters have turned from us so. Secondly in this situation it is not an option to disregard the nation’s verdict. The verdict was clear – the majority of voters did not give the Social Democrats a mandate to govern, the party became the third in size in parliament,” the member of the EK explained why he immediately cautioned his party against a coalition with the Peasant and Greens Union after the elections. In his opinion, the party requires much discussion, self-criticism and review. V. Andriukaitis says that already between the first and second round he urged to cease shooting one’s own leg. He notes that this way more mandates could have perhaps been earned. “Unfortunately that did not happen and now in the face of 17 mandates we have to think, what’s happened and how to act because pushing oneself into an even worse situation means the reduction of Social Democracy’s weight in Lithuania. And Social Democracy is needed like water in Lithuania. The Lithuanians need a true leftist party with a clear profile,” the politician told Delfi. According to Andriukaitis, it is necessary to consider what areas are crucial to the Social Democrats as a party of social justice. He raises the question, whether the obtained posts leading the ministries of economy, foreign affairs and justice are those that the Social Democrats need. “In my opinion it [should be] social security, education and healthcare. Well, yes justice as well, the Social Democrat platform can be showcased here by defending human rights and preventing deviations from essential constitutional provisions,” the member of the European Commission observed. With an evening deal behind closed doors, party Chairman Algirdas Butkevičius surprised even party negotiators, announcing that the evening deal of the party receiving the Ministry of Social Security and Labour was changed to the Ministry of Economy. Then the entire Social Democrat negotiation group, with the exception of A. Butkevičius and fraction prefect Irena Šiaulienė, released a statement to the party presidium and management that they are against the terms of the deal, namely the abandonment of the Ministry of Social Security and Labour. The statement was signed by Andrius Palionis, Julius Sabatauskas, Algirdas Sysas and Gintautas Paluckas. “I believe that it is not good that A. Butkevičius is unable to justify why this sort of thing happens. Deliberations have to be congenial, collective, necessarily involving party committees and definitely keeping programme premises in mind. Why did we lose? 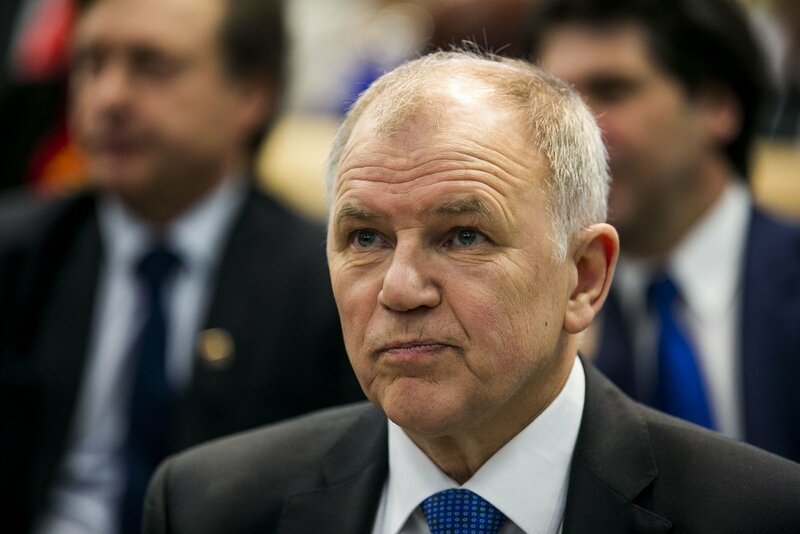 Because we were socially insensitive, specifically now we have to go through that purgatory and take the areas that require the most work, where we can prove that the Social Democrats are for social justice,” noted Andriukaitis. He did not comment on A. Butkevičius’ failure to be appointed Seimas Deputy Speaker. “A. Butkevičius publically declares that he remains faithful to the tradition of Western political parties, it is completely clear that the leaders who lead in elections have to take responsibility. This is not up for discussion for me. What is up for discussion is what should be done in spring, how to mobilise a party renewal, how to nurture new leaders and move forward. We have to prepare our forces for the municipal elections,” urged the Social Democrat. How does the politician view the events behind the appointment of the Minister of Justice and the proposed minister Julius Pagojus being recalled from cabinet? “Questions of Pagojus, Bernatonis, of course that it isn’t good, it is not beneficial. But it is completely clear that this is not a shock on the level of the election results. The results were a massive shock for the Social Democrats. We need to talk about it,” said Andriukaitis. In his opinion responsibility needs to be taken collectively – first of all there is the council, presidium, headquarters and congress. Delfi reminds that A. Butkevičius’ Lithuanian Social Democrat Party earned 17 mandates in the Seimas elections and conceded defeat. The party has formed a coalition with the Lithuanian Peasant and Greens Union, which won 56 mandates.